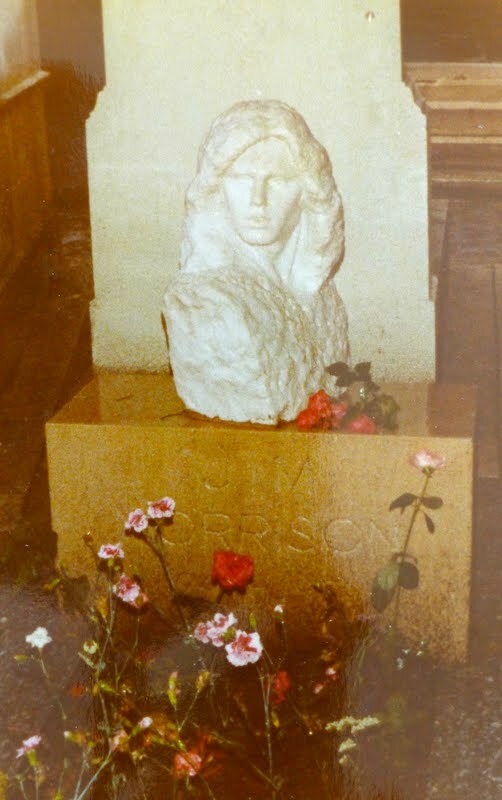 Jim Morrison's tombstone at Pere Lachaise Cemetery in July 1981. A couple of months ago, I wrote a post describing how distraught I was to learn that someone had stolen Jim Morrison's bust. It felt as if someone had pilfered a bit of my youth, but fortunately photographic evidence of my first pilgrimage to visit his grave in Pere Lachaise Cemetery was safely stowed in a dusty scrapbook in Annapolis. Pulling the book off of the shelf, a couple of photos and postcards flutter to the floor. The masking tape holding the mementos in place is starting to crumble and the picture of me sitting on a burro in Spain is mingled amongst the snapshots of our cheap hotel (and all of our hotels were cheap!) in Amsterdam. Flipping through the Paris pages, I see that they are largely intact, unlike Jim's grave. And there it is - the photo of the white marble bust with offerings of red roses and white chrysanthemums. The headstone and the flowers are wet, so my memories of trekking to Pere Lachaise in the cold rain weren't wrong. Further evidence of the cool temperatures can be found in a photo of me strolling through the Tuileries Garden while wearing the wool jacket that I had to use some of my meagre savings to buy in Norway. Travelling from Memphis, Tennessee, I had no idea that Europe wouldn't be hot and humid in June and July. It's good to see you again, Jim! Click here to read the post about my visit to Pere Lachaise cemetery in 2011. The Jim Morrison page from my scrapbook. Susan, First of all - many thanks for asking for permission to use the photo. After seeing some of my photos (and even an entire blog post) reproduced on other websites, I sincerely appreciate being asked. So, yes, you have my permission to use the photo. Shall I send it to you at your website? My internet connection is acting up this morning, but I'm going to check out your Paris Music Guide as soon as it's more cooperative because my son and I were just looking for some good places to listen to live music.